By the time you read this we would hope Bickel's have updated this packaging. It is plain and child-like and does little to raise interest. 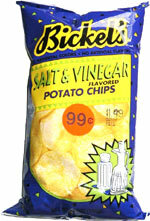 They say 'Picky People Pick Bickel's' and Hanover Foods did just that. So as they have been taken over we would expect updated branding any time now. A lightly colored Chip that is fairly thin. The double edged sword of 'thin' means the crunch is prevalent and in a crisp nature, rather than the hard crunch often experienced when munching into thicker Chips. The powder left on your fingers combined with the oil reminds you that you are consuming a fairly tasty if inconsistent Chip. Thin, but the pack was well aired so there was not much in the way of damage; few broken or cracked Chips. A mild and relatively inoffensive combination of both flavoring ingredients in the taste combo. Vinegar often overwhelms the salt to leave a sharp taste, but these did not do that.